First of all, I’ll mention that this movie is based on a true story. So there are no big action set pieces or noisy explosions. Instead you get a great story that is well acted and in parts is genuinely tense and exciting. To emphasize that this is a true story, as the film opens newsreel footage of sixties America plays. There are images of Martin Luther King, Robert Kennedy and John Lennon. Then we are introduce to Christopher Boyce (Timothy Hutton). He is quitting the seminary where he had been studying to become a priest. He returns home to his family. The patriarch of the family, Charlie Boyce (Pat Hingle) is a retired FBI agent and he has always had a shaky relationship with his son. However he arranges to get Chris a good job at RTX aerospace. Chris starts off as a general dogsbody doing small jobs and running errands. But it isn’t long before he is noticed, and soon is offered a promotion. He is promoted to a top secret section that works satellites. The satellites are used by the CIA to spy on, well … anybody they choose. Chris’ best friend is Daulton Lee (Sean Penn). They were alter boys together. Lee is a screw-up whose source of wealth comes from smuggling drugs from Mexico into the United States. It must be pointed out, that both Daulton Lee and Christopher Boyce come from affluent families and money is not really an issue for them. The fact that Lee chooses to work as a drug dealer comes more from boredom and a lack of self esteem than any actual financial necessity. Boyce’s new job is pretty cushy. His work partner Gene has a pretty lush setup. It’s boozy and cruisy, but one day, Boyce accidentally receives a fax from the CIA in Australia. It has meant to go to CIA headquarters in Langley but is misdirected to RTX. It’s a common mistake. This particular fax implies that the CIA have been manipulating the Australian press to overthrow, or at least turn public opinion against the incumbent government. The Australian Prime Minister at the time was Labor leader, Gough Whitlam. Boyce is disgusted that the United States would meddle in the affairs of another democratic country. As Boyce witnesses more information that highlights the US’s corruption of other governments he confides in Lee. He even decides to take it a step further, as punishment for their meddlesome ways, Boyce devises a plan where Lee will take certain bits of highly classified information to the Soviet Embassy in Mexico and sell it to them for a price. Initially, Lee is reticent to do the job, but it’s not too different to his clandestine drug smuggling operations, and once he gets a taste of the profits, he’s hooked. Even as the trading of secrets continues, Lee chooses not to scale down his drug smuggling enterprises. As a habitual user, as his drug use increases, Lee begins to unravel. As he becomes more unreliable, Boyce starts to play a more active part in the trafficking of the information. So far Boyce had been rather careful and methodical in his approach to the smuggling operation, but even as he gets drawn deeper in, he starts to become a paranoid wreck. This paranoia gets to a point where Boyce wants out of the game (if only it were that simple!) Lee, who believes that his livelihood is on the line, convinces Boyce to make one more exchange. Boyce reluctantly agrees, but it all goes horribly wrong when Lee is arrested outside the Russian Embassy on suspicion of murder. The strength of this film are the performances by Timothy Hutton and Sean Penn. Penn’s role is more flashy as the drug addled Daulton Lee, but because the character is such a screw-up, it’s hard to have sympathy for him at times. But Hutton’s performance is well measured. His character starts out young an idealistic, but by the end he is bitter, jaded and thoroughly repulsed by both the American and Russian intelligence agencies. The weakest part of this movie is the soundtrack by Pat Metheny and Lyle Mays. It is 80’s synth pop that has dated badly, and as the film is set in the mid 70’s does nothing to evoke the era in which the movie is set. Maybe the soundtrack worked when the film was first released when the sounds were contemporary, but viewing the film today it is jarring. 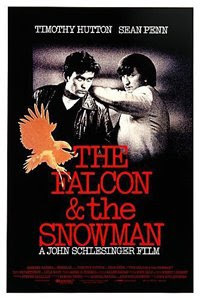 The Falcon And The Snowman is a very good film, but it does slow down in the third quarter, and the end, while not being vague, does seem heavily edited with chunks of important exposition, like time and place removed. These are small quibbles to what generally is a film worthy of your time. In addition, this is just the first part of the story on Christopher Boyce. Yes this is the story of The Falcon And The Snowman, but Robert Lindsay followed this story up with a book entitled The Flight Of The Falcon which outlines Christopher Boyce’s escape from prison is 1981 and the subsequent manhunt.